May. 24, 2013 4:00 p.m. 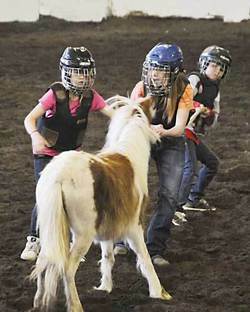 The Wild Pony Races pitted three youths and one wild pony at the Thorsby Haymaker Rodeo, a crowd favorite. Village of Thorsby – On the May Long Week-end, the THORSBY HAYMAKER RODEO gathered a long list of competitors from all over the central region –and beyond!- and hundreds of rodeo enthusiasts. “We are very pleased with this year’s attendance, and the number of rodeo participants: we are working already towards a bigger rodeo for 2014”, shared Lori Gunsch, a Thorsby AG Society member, the organizing body of this popular annual event. On Saturday morning, the Thorsby LIONS CLUB hosted a Pancake Breakfast, and repeated this delicious hospitality on the Sunday morning. Aside from this, the Club offered free camping at the Lions Campground, and hosted a three-day ball tournament which saw seven teams enthusiastically competing and ‘re-connecting’ all week-end! The THORSBY PARADE took place that morning: with forty entries, “the Village is proud of this local and regional parade participation; next year we are hoping for more horse and rider entries!” said the dynamic Thorsby Mayor –and passionate promoter-, Barry Rash. The Saturday morning saw the Slack event, where a mish-mash of competitors, some having registered late, got to compete to the crowd’s loud appreciation. Sunday at 1pm saw the MAIN EVENT take place. As a part of the Wild Rose Rodeo Association, this is a rodeo where a majority of the contestants are teenagers or young adults, hoping to excel and improve in a sport they love, and to someday reach a professional status. One of this young hopefuls is Chad Gulick, a 17-year-old Grade 11 Wetaskiwin student, who was calf roping but “not as well as I had hoped for on this week-end”. A resident of Wetaskiwin County, Chad, was also involved in the May Long AB High School Rodeo that took place in Rimbey on Sunday and Monday: he shared that he did much better at that second rodeo. Chad was also competing in Team Roping, a crowd favorite, with his grandpa Roger Gunsch of Thorsby. On the roster were also his mom Tracy and his sister Susan. Quite the rodeo-traveling family, they give credit to Roger for inspiring them, and teaching them “the ropes”, at a young age! The Saturday roster also saw two competitors from BRAZIL, Andre Omivera and Sergio Teixeira: not an unusual entry as some might think, as Brazil and Australia have often seen some of their more passionate bull riders come to Canada to compete in our rodeos, to gain more experience! A nice ‘international touch’ to our local rodeo! Bob Payette, CAO of the Village of Thorsby attended the Sunday afternoon performances with his daughter Caitlynn and they both enjoyed the calf-roping and the whole Rodeo atmosphere, pleased to notice the packed arena. The THORSBY SOCIAL took place that night, and more than 100 guests took in the fun and musical prowess of Puss’N Boots Sounds, a local DJ service owned by Carmen Fisher and her husband. More than 100 partygoers took in the celebration, and the organizers were quite satisfied with the numbers for this Communities In Bloom fundraiser, where FORTIS ALBERTA, a great community supporter, presented a $3,000 cheque to the Village of Thorsby, a Community Naturalization Grant. Nikki Smith is the dynamic district manager for Fortis who works diligently at cultivating that relationship. On Sunday, the performances were officially started with the GRAND ENTRY, where a group of local young ladies entered the arena, bearing flags of Canada, Alberta and of their Rodeo Sponsors. Amanda Morgan, a 16-year-old Thorsby High School student, was happy to be a part of it, carrying the Leduc County flag. Melissa Cunningham beautifully sang the National Anthem, while young Jessica Gunsch read the Cowboy Prayer with a touching gusto. Saddle broncs, Ladies, Junior and Pee-wee barrel racing, team roping and steer wrestling were all enjoyed by the large audience at the Thorsby Haymaker Rodeo. But the Wild Pony Races were undoubtedly a crowd favorite, pitting three youths against a wild pony: clad in chest flak jackets and helmets, these youths are usually not riders, but locals who decided to enter this competition for the fun of it. They have to be somewhat fearless, as these little ponies put up quite a fight before allowing (even for a moment!) one of them to get on top of it! All in all, the THORSBY HAYMAKER RODEO was a definite success, and it’s looking good for a bigger and better 2014 rodeo.